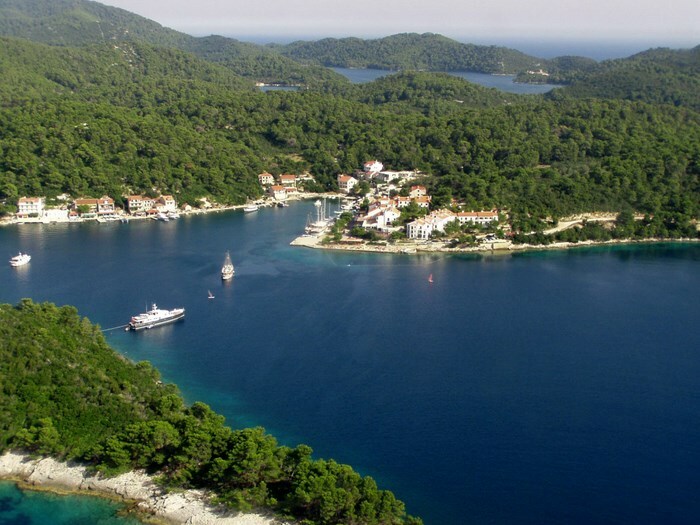 The island of Mljet is for many people the most beautiful island of the Adriatic. 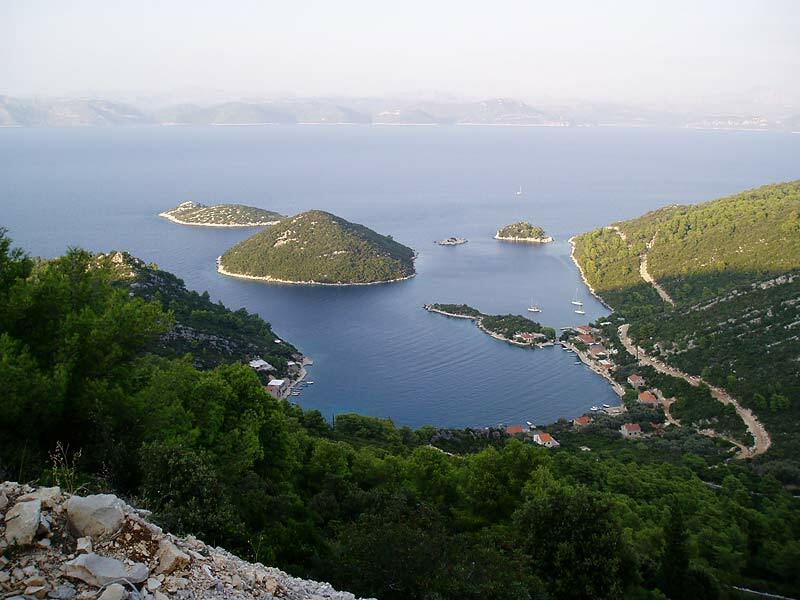 A legend says that Odysseus stranded precisely on this island and fatally fell in love with the nymph Calypso and spent some time on the island of Mljet. Centuries after Odysseus this nautical paradise makes us return and sail across its sea and in winter we remember it with longing. 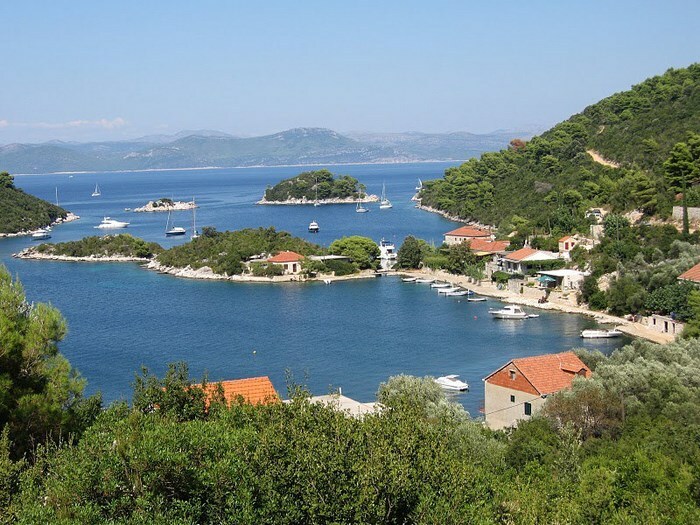 Saplunara – If you sailed from Dubrovnik and decided to go to the island of Mljet, the most beautiful and closest choice is Saplunara which is located on the SE side of the island. This part of the island is not the National Park but it is beautiful because of the beautiful sandy beaches. For an overnight in a storm, the best is the north-western part of Saplunara. The best hideout from the southern and south-western wind is the south-eastern part of the bay. In this part, long ago, an army built a small dock. No matter if you are on buoys offered by the restaurant in the western part or if you are anchored in the eastern part of the bay, we recommend a walk along the coast to a natural phenomenon – Blaca bay (the locals call it Limuni). It is a 20 minute walk from Saplunara so you’ll need shoes and a bottle of water. Limuni Beach is beautiful and large and the sea is warm. You cannot reach it by boat because the depth is only 1 meter, so the only way to reach it is by foot. If you sail with children, they will surely think of Saplunara and Limuni as the beaches of their dreams. Pay attention to the hungry wasps and do not give your children sweets or juices and avoid eating and leaving food in the cockpit. 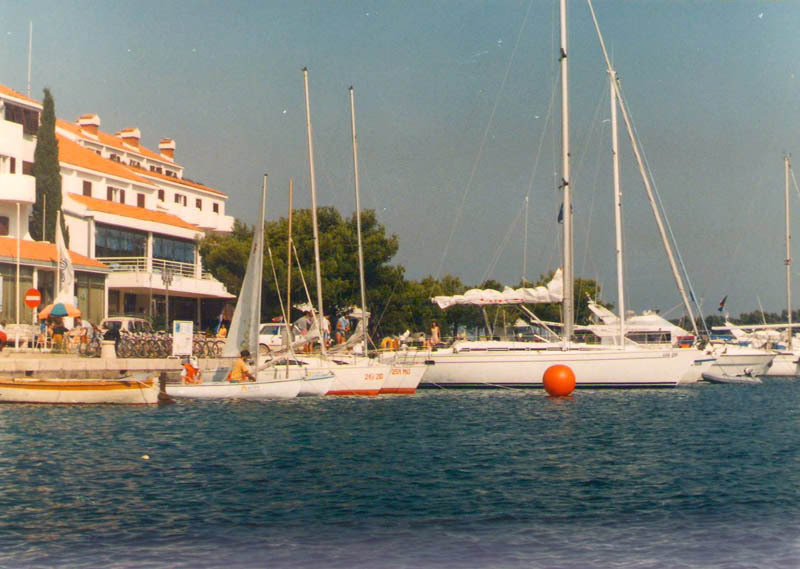 Prozura – It is located in the northern part of the island. It’s not an ideal anchorage as the neighbouring Okuklje because during bura and tramontana winds the sea is restless, but somehow it seems more beautiful because of the islets and rocks in front of it. Polace – This is the largest bay on the island. When you enter Polace, you are in the zone of the National Park. The bay is protected from bura and jugo winds. The walls of an old Roman palace are located next to the dock of the bay Polaca, and the famous Mljet lakes can be reached by car or by foot (2 km) passing the charming village of Govedari. 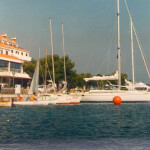 Anchoring in Polace and Pomena is charged 100 kn per person and it is also the ticket to enter the National Park. 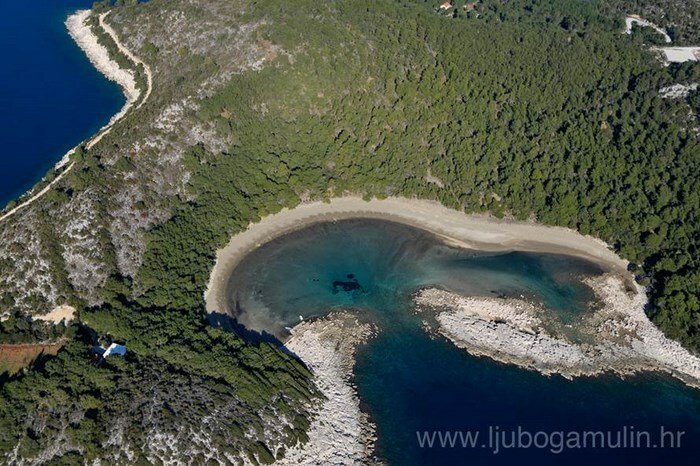 For those who love nature this is a great spot, and definitely worth staying at least one day and visit Mljet Lakes. There you can rent a bike, kayak or take a boat taxi to go to the island of Melita located in the heart of the great lakes. Pomena – It’s located on the western side of the island. There is also the Odisej Hotel in front of which you will find a 150 m long waterfront with water and electricity hook-ups. 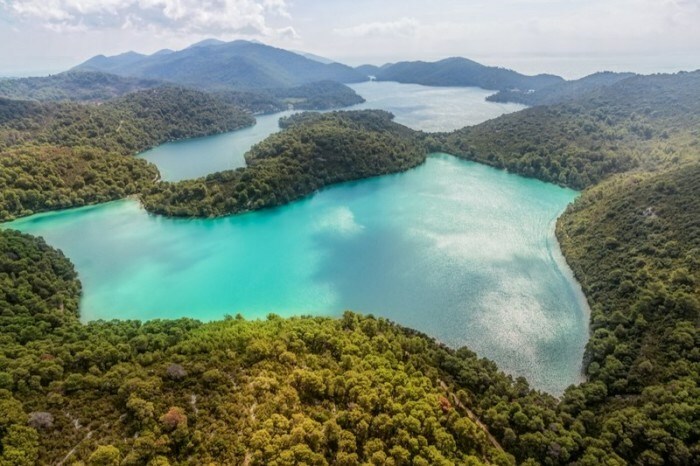 Since Mljet has no water supply from land, water is a major problem in the summer on the island and mostly for hotels so water wasting is not allowed. Since the hotel is situated in the National Park, all the activities take place there. 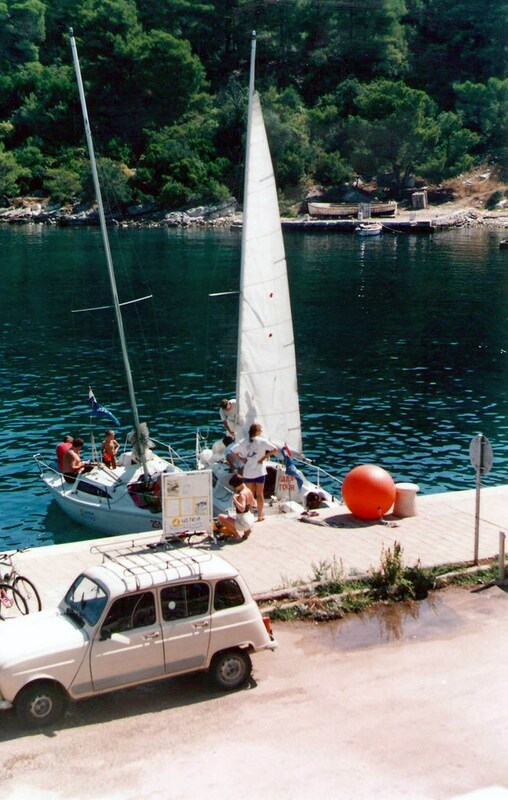 There you can arrange to go diving, visit the Odisej cave, rent a bicycle at Stjepo’s or a have cup of coffee in front of the hotel and watch the sailing boats. In Pomena there are two small shops and often women from neighbouring villages sell seasonal fruits and vegetables. Mljet is rich in fish but fishing is prohibited in the zone of 500 m from the coast. The fish you order in any small family restaurant will surely be fresh. A specialty on Mljet is of course any kind of fish, lobster, and we recommend you try wild boar for which Mljet is also known. 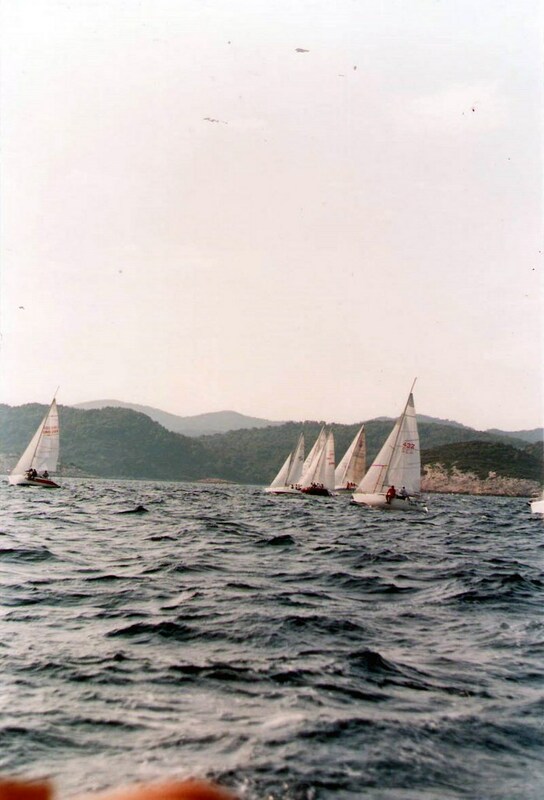 Mljet Lakes – Sailors who paid for a berth can at the same time enter the National Park with that ticket. 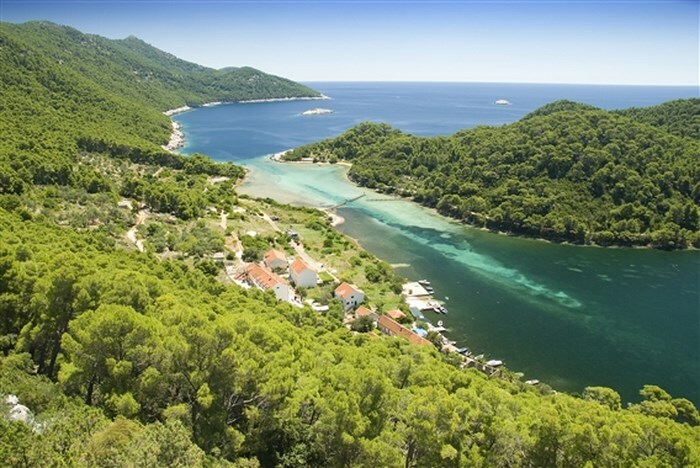 The shortest way to come to Mljet Lakes is through Pomena; it takes a 5-10 minute stroll through a dense pine forest. When you get out of the forest, you will meet the peace of two lakes (small and large) and you’ll want to jump into immediately. This short walk the lakes in the summer afternoon made most of us say that Mljet is the most beautiful Adriatic island. Children usually like to slide down on a small waterfall on Mali Most (contact point of Big and Small Lake) so don’t let them miss this experience. If you are into action, rent a kayak at Stjepo’s and go to the small island of Melita and a monastery from the 12th century. There is also a small restaurant where you can have a break and continue kayaking till the end of the Big Lake and Soline place where the lakes meet the sea. You can take a tour of the lakes by bike and the island of Melita can be reached by small boats that belong to people from Babine Kuce (a small place next to the lake). In Babine Kuce and Soline, small places at the lakes, there are several small family restaurants. 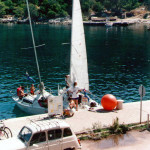 In Pomena on Mljet, Ultra sailing had a sailing school from 1996 to 1999, so below you can see some of the old photos from that time. 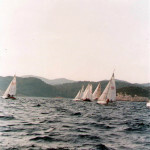 Ultra sailing on Mljet from 1996. – 1999.